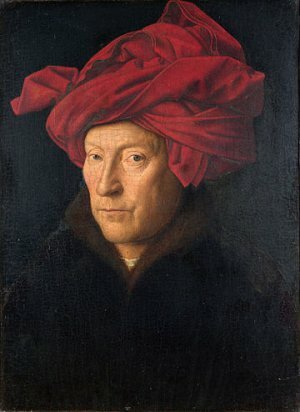 Jan Van Eyck (YAHN van IKE) was born in the Netherlands. The exact year of his birth isn't known, but it was somewhere around 1390. His paintings are very detailed. Most artists of the time painted with tempera, a mixture of colored powder and egg yolk plus some other substance. Tempera dried quickly and the artist had to work fast. When it dried it had a dull finish and if a sheen was desired, a glaze had to be applied. Van Eyck was not the first to use oil paint, but he mastered the use of oil in paints. He was able to get stunning results. He used walnut oil and other oils to make the paints and let each thin coat of paint dry before applying another coat of paint over it, giving the painting a three-dimensional appearance. The colors in his paintings are delicate and have a beautiful shine. He was called "The King of Painters" by people even hundreds of years after his time. Duke Philip the Good of France wanted to marry Princess Isabella of Portugal. He sent Van Eyck on a diplomatic journey to propse to her. He had never seen her and there were no cameras or photographs in those days. Van Eyck painted a portrait of Isabella to bring back to him. Evidently Duke Philip was pleased with the results. 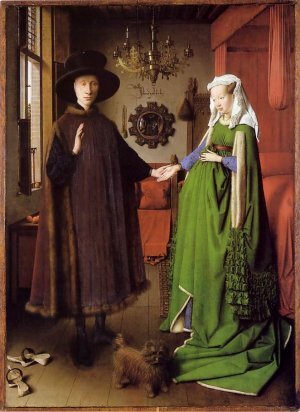 The painting we are studying; The Arnolfini Marriage, is a record of the marriage of the two people in the picture. In modern days, a couple would hire a photographer to record their wedding. Giovanni Arnolfini hired an artist to paint the picture. In addition to being a portrait, it is also a legal record showing that the marriage took place. The artist signs it as a legal document. In The Arnolfini Marriage all the objects in the room have meaning. Oranges and lemons were very expensive because they had to be imported from Spain. There are four oranges in the picture suggesting the wealth of the couple. The little dog is also an expensive breed. The way the women wore their dresses gathered up in front made them look pregnant whether they were or not. Some historians surmise this painting is an actual wedding portrait and that the figures in the mirror might be witnesses. Others say the couple was only engaged and one source will tell you his marriage was recorded in 1447 and the picture was painted in 1434. So, who was that woman? We can only surmise. You will enjoy looking at some of the details of the painting in the Research Links. Van Eyck painted several pictures of Mary and Jesus including a beautiful painting called Madonna in the Church which was painted in the 1430's. 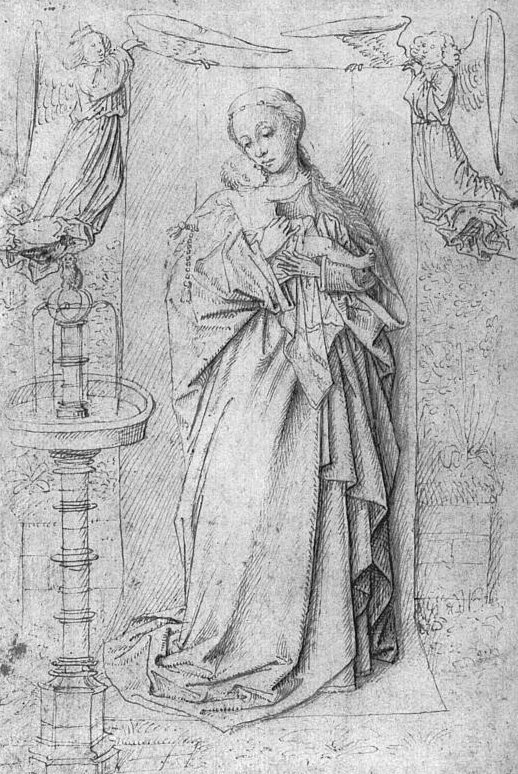 Another Madonna painting which still exists Madonna at the Fountain can be compared to the sketch he made in preparation for the painting. 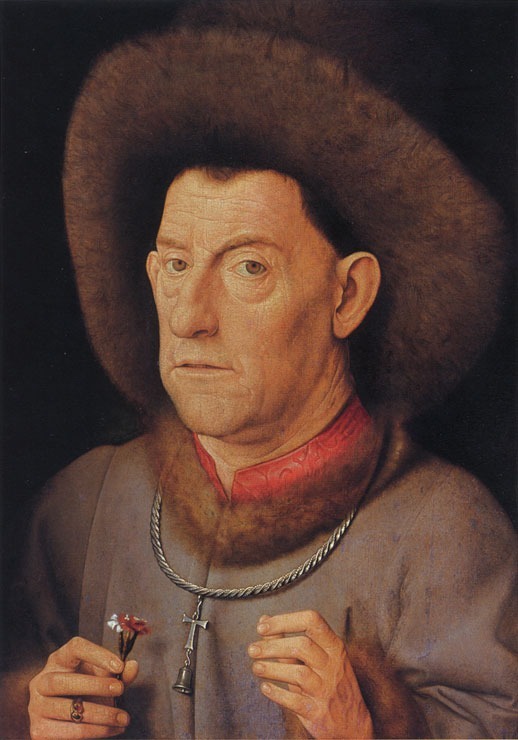 Van Eyck painted portraits of people. We don't know who the posed for Man with Carnation. 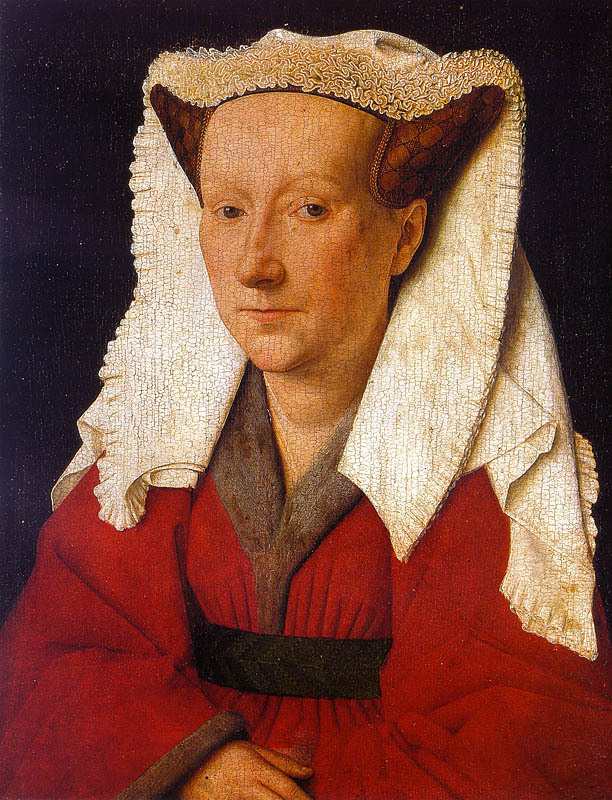 There is debate about the identity of Margaret Van Eyck. It was probably his wife, but some say he had a sister named Margaret. The third picture is Giovanni Arnolfini, the subject of the The Arnolfini Marriage. 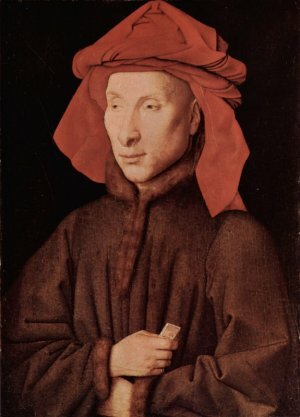 It is thought that Jan Van Eyck had a brother named Hubert who was 20 years older. 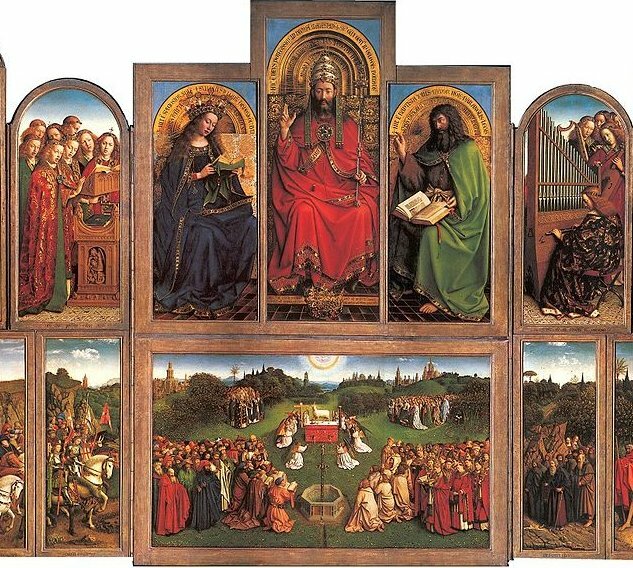 Supposedly, the famous Ghent Altarpiece was started by Hubert and finished by Jan after his brother's death. He painted over some of the work Hubert had already done. 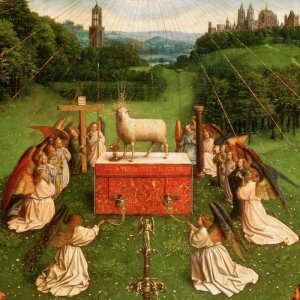 Since their style was similar, it is hard to tell which artist painted particular parts of the altarpiece. This magnificent painting is very large and painted in several panels, 12 in all which fold toward the center. There are more paintings on the back of the panels. The work is approximately 12 by 18 feet. A triptych (TRIP-tik) has three panels. 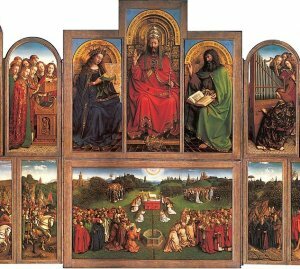 This would be called a polyptych (POL-ip-tik), having many panels. The altarpiece is in the Cathedral of St. Bavon in Ghent. After completing this huge work he painted much smaller pictures. Van Eyck married in 1431 and bought the house where he would spend the rest of his life. After his death his widow was having money problems and Duke Philip was kind to her and helped her financially. Use the Image Viewer on the page to see an even enlarger view. Lovely explanation of one of the oldest wedding portrait paintings! Today it's becoming popular to hire a<a href="http://www.specialeventpainter.com">live wedding painter</a>, anyone done this? The dog in this painting is soooo cute! Where is the link "Details of the Painting"? This page displayed 191,947 times.